In mid-2016, we launched several products and released multiple updates, which resulted in a number of technical issues that diminished the performance of our application. We believe these performance issues resulted in a reduction in growth of Daily Active Users in the latter part of the quarter ended September 30, 2016. I think broadly speaking if you look at rest of world growth as a proxy for Android, you can start getting an understanding for the performance issues we face on Android in the last two quarters. I’d love to speak a little bit to the DAU question, because it’s a question that we get all the time. And I think one of the reasons why it’s such a popular question is because there’s a lot of this thing in our industry called growth hacking, where you send a lot of push notifications to users or you try to get them to do things that might be unnatural or something like that. And I think while that’s the easy way to grow daily actives quickly, we don’t think that those sorts of techniques are very sustainable over the long term. And I think that can ultimately impact our relationship with the customer. This quarter, we grew our Daily active users at a lower rate than we would have liked, adding 4.5 million new users. This can be partially attributed to our decision to report our daily active users as an average over the entire quarter, where a strong September was offset by the more modest months of July and August. Ultimately though, we want to drive more user growth in 2018. As we have mentioned on our past two earnings calls, a change this big to existing behavior comes with some disruption, especially given the high frequency of daily engagement of our community. While we had an average of 191 million daily active users in Q1, our March average was lower, but still above our Q4 average. We are already starting to see early signs of stabilization among our iOS users as people get used to the changes, but still have a lot of work to do to optimize the new design, especially for our Android users. While our monthly active users continue to grow this quarter, we saw 2% decline in our daily active users. This was primarily driven by a slightly lower frequency of use among our user base due to the disruption caused by our redesign. It has been approximately six months since we broadly rolled out the redesign of our application and we have been working hard to iterate and improve Snapchat based on the feedback from our community. Note that this last explanation is a bit different than the others: Snap was admitting that its core users were using the product less. The problem is that while social networks making blunders in the user experience is hardly a new phenomenon, the difference between Snapchat and, well, Facebook, is the lack of growth — going on for two years now — to make up for it. And, of course, there is the reason for slowing growth that Snap’s executives can’t bring themselves to acknowledge: Instagram Stories. In short, Instagram Stories not only prevented users from defecting to Snapchat, it also took all of Snapchat’s growth, and now, after Snapchat’s re-design snafu, is likely taking users away. Two weeks ago, after Facebook experienced the largest single day market-cap decline in U.S. corporate history, I argued that, if you looked at the company through any lens but a financial one, the company was stronger than ever. For all of the company’s travails and controversies over the past few years, its moats are deeper than ever, its money-making potential not only huge but growing both internally and secularly; to that end, what is perhaps most distressing of all to would-be competitors is in fact this quarter’s results: at the end of the day Facebook took a massive hit by choice; the company is not maximizing the short-term, it is spending the money and suppressing its revenue potential in favor of becoming more impenetrable than ever. That reference to “taking a hit by choice” was primarily about the reduced margins Facebook is projecting thanks to its dramatically increased spending on security; it certainly hurts in the short-term, but keeping people on the platform and regulators away has massive long-term value. It should be noted, though, that Instagram Stories in particular (along with Stories on Facebook’s app) are in a similar vein: their strategic impact, particularly in terms of Facebook’s competitive position relative to Snapchat, will be felt for years. There is a financial impact in the short-to-medium term, though, and it may be significant. It’s better for an advertising business to not be a platform. There are certain roles and responsibilities a platform must bear with regards to the user experience, and many of these work against effective advertising. That’s why, for example, you don’t see any advertising in Android, despite the fact it’s built by the top advertising company in the world. So a Facebook app owns the entire screen, and can use all of that screen for what benefits Facebook, and Facebook alone. You can’t help but see the advertising, which makes it particularly attractive to advertisers. Brand advertising, especially, is all about visuals and video (launching soon! ), but no one has been able to make brand advertising work as well on the web as it does on TV or print. There is simply too much to see on the screen at any given time. This is the exact opposite experience of a mobile app. Brand advertising on Facebook’s app shares the screen with no one. Thanks to the constraints of mobile, Facebook may be cracking the display and brand advertising nut that has frustrated online advertisers for years. To be sure, the fact that News Feed ads take over the screen isn’t the only reason Facebook’s stock is, even with the recent drop, up 148% since that article: in the intervening years the company has doubled its userbase, increased ad load in the News Feed, and managed to increase its price-per-ad thanks to Facebook’s superior targeting capabilities. 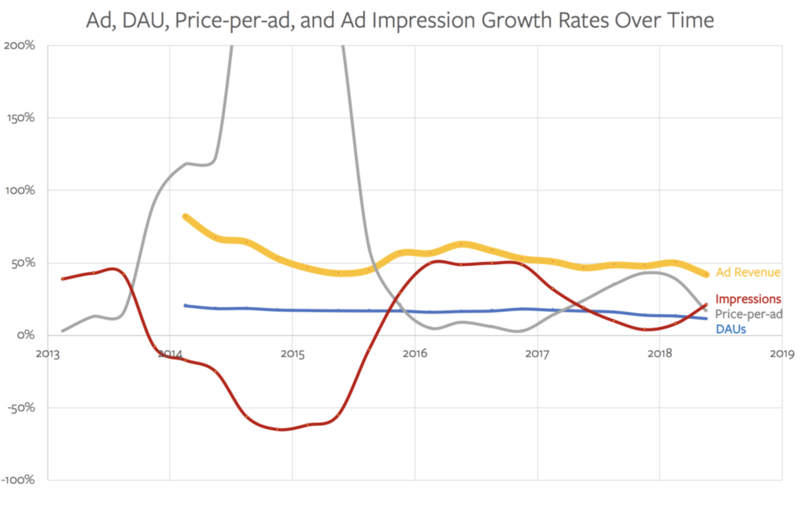 The years after the mix shift have only reinforced just how good the News Feed ad unit is: by 2016 the shift was complete and Facebook just grew and grew, quarter after quarter (remember, that chart is growth rates; a chart of absolute numbers would be up-and-to-the-right3). 2017 was even more interesting: the company said it would stop increasing ad load in the News Feed, which is why impressions fell, but the price-per-ad increased in response. This demonstration of pricing power is as clear an indication as you can get that Facebook’s News Feed ad was highly differentiated. There are several factors contributing to [revenue growth] deceleration. For example, we expect currency to be a slight headwind in the second half versus the tailwinds we have experienced over the last several quarters. We plan to grow and promote certain engaging experiences like Stories that currently have lower levels of monetization, and we are also giving people who use our services more choices around data privacy, which may have an impact on our revenue growth. Instagram has more heavy usage of Stories, so that’s an area of continued growth opportunity because the effective levels of monetization in Stories are lower. On the demand side, we see a good traction across both platforms, and we’re rolling out more ability for advertisers to leverage ads in Stories with more formats and the like. So that’s, again, an important opportunity for growth is just continuing to build out more products on the demand side for Stories. We’re going to be focusing on growing engaging new experiences like Stories and promoting those. And that’s going to have a negative impact on revenue growth. We’ve seen great progress with Stories as a format for people to share on our platforms. We have 400 million people sharing with Instagram Stories, 450 million with WhatsApp Status. Facebook is newer, but we’re seeing good progress there. The question is will this monetize at the same rate as News Feed? And we honestly don’t know. In fact, there are two good reasons to be pessimistic: one from a user perspective and one from an advertiser perspective. From a user perspective Story ads are far easier to skip: simply tap the screen, much as the user has probably already been doing for the last several minutes feverishly trying to catch up on their Story backlog. Part of what makes Stories such fantastic drivers of engagement is the combination of their disappearing nature — better check frequently to not miss anything! — combined with the simple mechanic of viewing them: tap tap tap. An absence of friction, though, is always a challenge when it comes to monetization. We’re really excited to announce today that 65 million businesses are using our free Pages product and 5 million are using Instagram Business profiles. More and more of these businesses are becoming advertisers with over 4 million advertising on Facebook and over 500,000 on Instagram. As a result, our revenue base is becoming more diverse. In Q4, our top 100 advertisers represented less than a quarter of our ad revenue, which is a decline from Q4 last year. This is another reason why News Feed ads are so effective: advertising is measured on ROI — return on investment — and the “I” is just as important as the “R”; the investment necessary to achieve a favorable return is so much lower for News Feed ads than nearly any other medium, and experimentation is cheap-and-easy. Small wonder small- and medium-sized businesses flock to Facebook (and a reminder that Facebook’s advertising platform is a critical piece of building the economy of the future); to that end, though, it is fair to wonder just how much of Facebook’s advertiser base will flock to Instagram Stories, even as its users do exactly that. That noted, Stories potentially have significant value for Facebook beyond strategic positioning. First and foremost, the fact that users find Stories even more engaging than the News Feed suggests there is at least the possibility to create even more engaging advertising as well. That is particularly compelling because attentive readers may have realized my 2013 excerpt above about the effectiveness of News Feed ads got one thing wrong: I was convinced that taking over the screen would be valuable because of the potential for brand advertising; in fact, most of Facebook’s business is in direct response ads, where the goal is driving user action (app install, product purchase, newsletter signup, etc.) as opposed to simply building brand affinity. The latter remains very television-centric even as young people desert the medium, and every tech company is working feverishly to capture their share of that television money that will be going digital any day now! With 1 billion active people on the platform, I think Instagram is definitely both a direct response opportunity and an opportunity for discovery. Part of it’s the format. The format is so visually appealing and people are telling stories with pictures, so we see both anecdotally and in the data that this is a great place for people to become aware of a product in the first place. This is in fact another way to look at that chart about the top 200 advertisers: the biggest spenders are brand advertisers, and while it is to Facebook’s credit that they serve the long tail, there remains a significant opportunity the company has mostly not tapped into, and oh-by-the-way, those are the advertisers best equipped to spend the money to make an effective Stories ad; after all, they’re already spending the money on TV. That noted, it is possible the pot of brand advertising gold that tech companies are chasing may end up being at the end of the proverbial rainbow, always pursued and never obtained. Do big brands stick with TV because the medium is that much better for advertising, or because they were built for a mass market that on the Internet increasingly doesn’t exist? Indeed, one can make the case — as I have — that the fortunes of traditional television and its advertisers are completely intertwined; unsurprisingly, the disruptors of the latter use Facebook. There was one small bit of good news for Snap in this analysis: a significant challenge for the company was the de facto requirement that advertisers devote outsized resources to the platform, killing any long-term ROI proposition. The issue is formatting: Snapchat ads are vertical, ideally video, and it was so much easier to simply buy a News Feed ad on Facebook and run it on Instagram. Now, though, an advertiser’s investment in vertical video ads can, at least in theory, be used on both Instagram and Snapchat (and all of Facebook’s other properties after its attempt to put Stories everywhere). This is small solace to be sure: Instagram has a larger audience — including most of Snapchat’s — the entire Facebook advertising apparatus behind it, and all of the trends are in its favor. That is the sort of long-term gain for which Facebook is rightfully willing to bear the short-term pain; the question now is just how substantial that long-term gain may be, and relatedly, how long the short-term pain will persist.